Don’t you feel it in the air? Spring possibilities are about to cede to summer pleasures. I’ve been ruminating on the importance of spring cleaning for your creating life and have covered the first two steps—reassessment and reorganization. The third step is the most powerful one—rededication. To rededicate ourselves to something we deem as special in our lives strengthens and amplifies our commitment. Rededicating ourselves to our creative life sends a joyful message to our ‘Creative Self’. Our Creative Self loves to be wooed. Its language includes ritual, ceremony and demonstrative acts of appreciation. What aspects of the creative life would you like to rededicate yourself to as you move into summer’s rhythms? I rededicate myself to uplifting and amplifying other writers. I rededicate myself to patience and persistence in claiming a creative life. I rededicate myself to owning my creative impulses, even in the face of naysayers and saboteurs. I rededicate myself to knowing that my creative work will matter to someone, so I must finish it. I rededicate myself to curtailing the diet of my inner critics, who feed on fear, and instead nourish my Creative Self with periods of rest and play. I rededicate myself to appreciating my Creative Self’s firework moments and subtle whispers. I rededicate myself to taking incremental steps to finish my creative projects. I rededicate myself to sending more of my work to professionally paying venues. I rededicate myself to naps, a restful schedule, and daydreaming, all of which nourishes my Creative Self. I rededicate myself to cultivating time for reading. I rededicate myself to spending time revamping this blog! 1) You reassess your space, your schedule, and patterns of mind to see what is supporting or not supporting your creative life. 2) You reorganize your space, schedule, and patterns of minds to allow you to create with more ease. 3) After reassessing and reorganizing, you rededicate yourself to having a productive and joyful creative life! If you’ve spent some time reassessing your space, schedule and patterns of mind, in connection to your creative life, then you should be in great shape for the next step which is reorganizing. Reorganizing is an essential component of this process. And, this is where we can get stuck very quickly. In dealing with physical reorganization, if we don’t plan carefully, we’ll leave lots of stuff just laying around. We actually have to combine intention with action to yield results. Besides thinking of what’s working or not working in your physical space, you might also want to evaluate how and when you schedule your creative work. Really, it’s about having a creative rhythm. The word schedule conjures up the endless to-do-list. Spring and then summer usually bring new rhythms into our life that can support our creativity. We are often making time for fun travel, to being outside more, and to taking much needed breaks and naps. All of this can be used in service of establishing a different creative rhythm. How can we reorganize our schedule to take advantage of this energy? How do we cultivate the patience and spaciousness of mind so that we catch those wonderful ideas that David Lynch refers to? -Move your practice outside for some of this season. If your tendency is always to be tucked away in a home office, take opportunities to write at the beach, at the lake, or at a state park. -Take more advantage of the longer periods of light this season. Can you rise an hour earlier to shoot your photographs or try writing later in the day during the season’s glorious sunsets? -Keep an idea journal. This is a place for all your ideas as they bubble up. Give yourself lots of permission to allow this idea journal to be filled with musings that delight you. Don’t put any pressure on yourself to turn these ideas into ones that have to ‘become something’. The idea journal should be a place to have fun and play. Last week, I was away at sea, on a cruise, so I wasn’t able to post. This trip was the kickoff to my upcoming 50th birthday and there is LOTS to tell about that (I got to visit Cuba!). I will share my reflections SOON. Today, I wanted to follow-up on ridding ourselves (or at least examining) unhelpful patterns of mind as part of my Spring Cleaning and the Creative Life series. My last post was on fear and there is *always* more to say about this topic. Four years ago, I wrote a poem about fear and its presence in my creative life. Four years ago, I held a big creativity summit online with renowned coaches and writers. I went on a roller coaster learning curve and at times it was painful. Four years ago, I was also submitting my work like crazy and getting poems published and placing in contests. Inevitably, as we grow bigger, we often have to deal with our fears that come wrapped in new clothes. This was true for me in 2014. Looking back now, I can see that my creative growth triggered a powerful fear attack. If I hadn’t pushed through it, I might have stopped on my creative journey and never made it to this amazing time in my creative life. As a coach, I have found that the number one thing that stops most people from pursuing their deepest and most meaningful heart’s desire is fear. Fear comes in a variety of forms, shapes and personas including ‘what will they think’, ‘I’m not good enough’, ‘I’ll never make money doing what I love’, ‘I need more credentials’, and ‘what if they don’t like what I create’, etc. None of us are immune from feeling fear, especially when we’re moving outside out comfort zone. The danger is that fear with its tricky (and sometimes believable) tunes of gloom will get the best of us and immobilize us for far too long. I’ve had my own run-ins with fear over the years. What follows below is an impromptu ‘talking back’ that I recently gave to fear. How dare you try to intimidate me! Do you know what I’ve lived through? What else do you think you can do to ME? How dare you sit there! So what if they laugh? I’m supposed to be worried if the unspecified THEY laugh? How dare you trying to make me afraid! How are dare you, FEAR! Wow, we’re in the middle of the second quarter of the year! Can you believe it? It seems like only yesterday when we were writing down resolutions for our creative lives for 2018. Have some of those commitments and intentions gotten sidetracked since then? Totally understandable. Spring can put us back on track. This season enables us to connect with a feeling of renewal that we begin to see physically manifested all around us. Spring also powers us with the energy to tackle the physical spaces (and states of mind) that no longer serve our creative life. Several years ago, I started writing about the power of spring cleaning in support of one’s creative life. Spring presents us with a perfect time to reassess, reorganize and rededicate ourselves to the projects that we most want to bring into the world. Clutter can immobilize our creative lives. Ah, Houston…we have a problem! 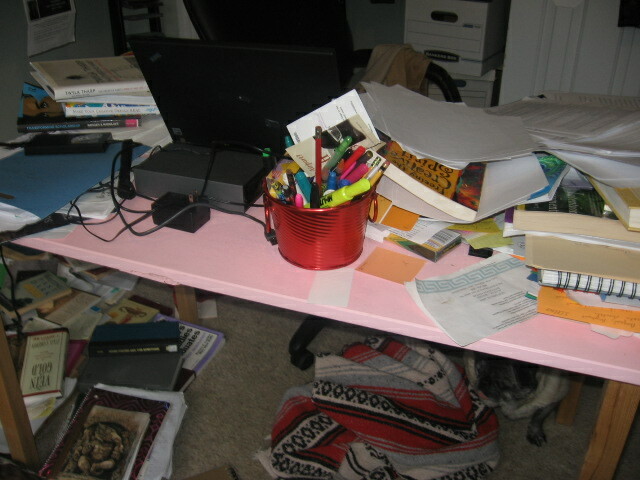 I know from personal experience how debilitating and draining it can be to work in a perpetually cluttered space. I’ve written about how powerful it was to tackle clutter and re-imagine my home writing space. In upcoming posts, I’ll talk more about the 3 ‘R’s as it pertains to schedule and patterns of mind. But, let’s start with reassessing your space. What about your creative space? Does it need a spring tune-up? Go and look at your creative space. What’s the state of it? Do you feel a sense of ease when you look at it? Is it crammed with stuff that belongs in other rooms of your house? If you live with other people, is this space known as your special writing/photography/painting, etc., area? Have you even claimed some special place yet, or are you waiting for permission from someone else? If you’re struggling with this, see my post on claiming creative space. Survey your space and make a quick list of what you feel needs your attention most. The questions below are not exhaustive*, but offer a good place to begin. 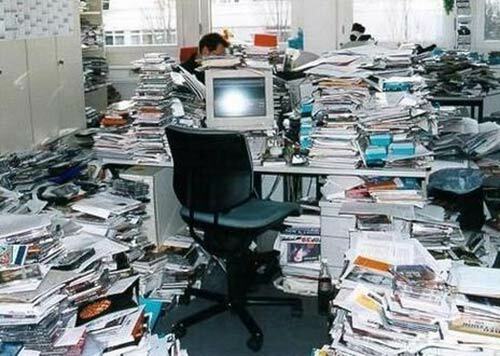 -Do you need to organize and sort your paper files? -Would it be useful to create an index for your piles of journals, scripts, flashdrives, DVDS, boxes of sewing materials (i.e. whatever you consider your primary creative material)? -Are there notes from conferences, master classes, residencies and/or workshops that need to be reviewed and filed? -When was the last time you did a backup of your computer files? Do you need to delete or add programs? -Are there financial records related to your creative life that need to be updated? -Are there creative projects that you’ve abandoned that still take up lots of physical space? Can they be re-purposed or stored elsewhere? -Do you need to physically clean your computer? -Do you have visible reminders of your creative accomplishments? Is it time to take some down and put up new ones? -Do you have too much or too little of something in your space? -Do you need more or less shelf space? -Are there big physical jobs you’d like to do (e.g. paint)? Once you have your list you can break each item down into specific tasks. It’s important to not get overwhelmed during spring cleaning. Many people decide they will devote a day to a spring cleaning project and then realize that they’re cranky after two hours and that the task requires at least two days. Start small and reward yourself often. Why not take from now until the official start of summer to spring clean? You could choose one project each week. I suggest working in 15-30 minute intervals so there’s less chance of getting frustrated and overwhelmed. I enjoy using an online stopwatch. What plans do you have for spring cleaning in relation to your creative projects? Spring possibilities are about to cede to summer pleasures. I’ve been ruminating on the importance of spring cleaning for your creating life and have covered the first two steps—reassessment and reorganization. The third step is the most powerful one—rededication. To rededicate ourselves to something we deem as special in our lives strengthens and amplifies our commitment. I rededicate myself to claiming my creativity despite bouts of envy, doubt and fatigue. I rededicate myself to remembering that I am here to seduce and delight the reader. I rededicate myself to finding ways to make writing fun and feel like a game. I rededicate myself to looking at revision as a way to honor my writing by keeping the right words and setting the rest free for another day. I rededicate myself to spending time honing my social media presence. Reassessing your physical space is a great place to start because it is visible and you spend a lot of time there. Another thing to reassess during spring cleaning are your ‘patterns of mind’. By this I mean, the habitual ways of thinking and responding to your creative life. I’ve been looking at the pattern of fear. Fear can show up in so many ways in a creator’s life. We fear to write, draw, and sing badly, we fear rejection, we fear we won’t reach our potential, we often fear the blank page, canvas, music studio, etc. Fear often causes us to procrastinate. Recently, I noticed that I was procrastinating on contacting an editor of a magazine that I met in January. This editor encouraged me to send him a story of mine. I’ve known for months exactly the story that I want to send him. Sending him my story has been at the top of my to-do list, but I have had some fear around taking action. Ironically, I’m not afraid of getting rejected. I’ve been writing long enough to not be undone by rejection. I know rejection is part of the writing process. What was it then? It was a ‘taking the next step’ fear. Since I’ve met him, he’s not a faceless editor anymore. Sending my work to him because I met him and he was encouraging made it harder, not easier. I know this sounds weird. Fears are far from rational! And, because he wanted me to send it to his assistant, and not through the regular submission process, it triggered a fear of ‘not getting it right’. These twin fears around ‘taking the next step’ and ‘not getting it right/doing it right’ are familiar patterns of mind that I am paying attention to this spring. To put fear in its place, this weekend, I set a deadline for myself. I wrote a very nice email to his assistant and sent my story with it while I was also so sending out other submissions for this month. I keep a submission sheet to record where and what I have sent out to contests and journals. Fears never go completely away, but I’ve now got these two on the run for at least a few more weeks. Do you have pattern of mind that needs some attending to during spring cleaning? Does Your Creative Life Need a Spring Cleaning? This week ushers in spring for many of us. It also marks passage of the first quarter of the year. Can you believe it? It seems like only yesterday we were writing down our resolutions for living an even more inspired creative life in 2015. Have some of those commitments and intentions gotten sidetracked since then? It also presents us with a perfect time to reassess, reorganize and rededicate ourselves to the projects that we most want to bring into the world. 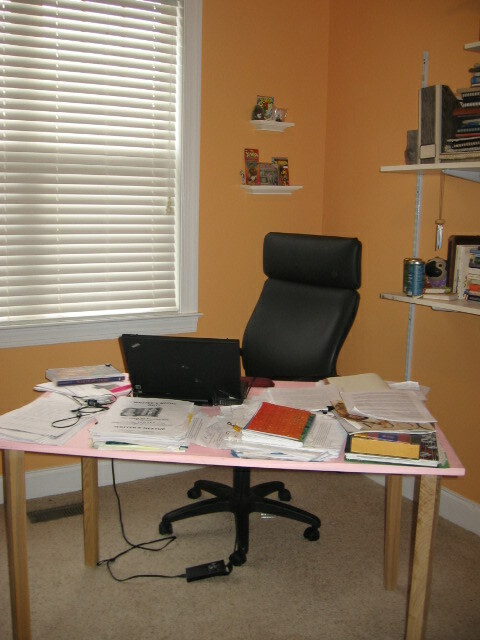 I know from personal experience how debilitating and draining it can be to work in a perpetually cluttered space. I’ve written about how powerful it was to tackle clutter and dramatically change my home writing space. In upcoming posts, I’ll talk more about the 3 ‘Rs’ as it pertains to schedule and patterns of mind. But, let’s start with reassessing your space. -Would it be useful to create an index for your piles of journals, scripts, CDs, DVDs (i.e. whatever you consider your primary creative material)? What kind of spring cleaning are you planning to do in support of your creative life? I’d love to hear.